In 1975, investigators discovered a set of very strange footprints in a forest in the Pacific North West. The footprints were human-like, except that they were 18 inches long and 7 inches wide. The size of the foot suggested that they were dealing with some kind of giant human. Of course there was a lot of skepticism at the time. After all, it was highly unlikely that a being of that stature would live so close to civilization. However, in the early 70s there was evidence that it was very likely for a tribe or an individual to live in the forest for long periods of time before being ‘discovered’ or contacted. Such was the case of a tribe of indigenous people called the Tasaday who were allegedly found on the island of Mindanao in the Philippines. They remained unknown, living on the edge of civilization, until 1972. Although in 1986, there were accusations that the ‘discovery’ of the Tasaday had been a hoax, still the fact remains that there’s a lot that scientists don’t know yet, even today. Another example is the story of Ishi, an indigenous man originally from the extinct Yahi people. This man lived alone in the forest near Sacramento, California. In 1912, he emerged from his isolation and proved that creatures such as the Bigfoot or Sasquatch could actually live among us without our knowledge. In order to draw conclusions regarding the existence of monsters such as Bigfoot, all the evidence needed to be examined. By the mid 70s there were already at least 300 reported sightings of a creature that was human and apelike, hairy, and had an overpowering scent. It was called by different names in different parts of the country, yet the descriptions were all similar. In spite of all the eyewitnesses and many pieces of evidence such as hair samples, photographs, and films most scientists refused to accept the possibility of the existence of some type of monster. Many said at the time that these sightings were just the result of the imagination and old folk tales that had been passed on for generations. 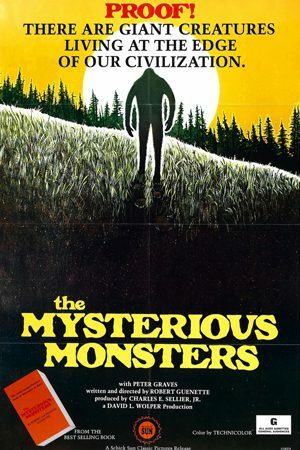 This 1976 documentary about Bigfoot, the Loch Ness Monster and other mysteries is hosted and narrated by Actor Peter Graves. The eyewitness accounts, footprints, audio and video were meticulously scrutinized by the technology that was available at the time. The objective was to prove that these elusive creatures actually existed and were real. Described as ‘the most startling film you may ever see’, the documentary also takes a look at the role played by psychics, hypnosis, and the history of the yeti in ancient cultures. In the end it asks the vital question, “If fingerprint evidence can be used to hang someone, why can’t footprint evidence be used to prove the existence of someone?” Draw your own conclusions as you watch this now. This episode examines the controversial 1967 Patterson-Gimlin film and features interviews with various bigfoot researchers and believers. Purported evidence and hoaxes are examined in this in-depth look at the legendary creature.